For 16-year-old Hannah Lamm, attending Delano High School this past year was an adventure she will never forget it either. 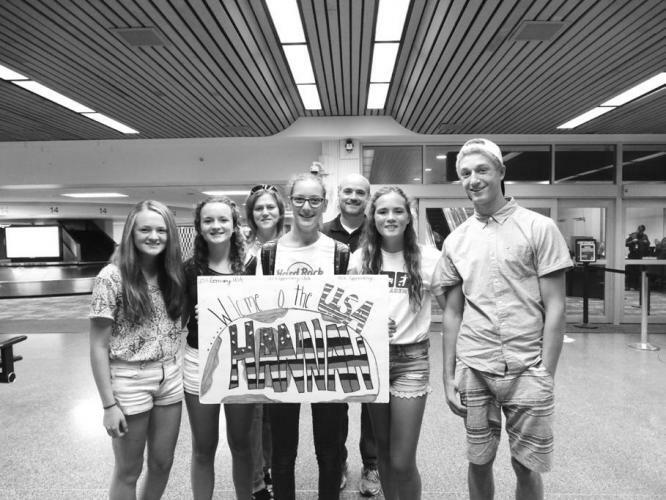 Lamm is from Offersheim, Germany and came to the Twin Cities through Ayusa Global Youth Exchange. Richard and Julianne Paskach, who had previously hosted a male student from Spain, saw Lamm's application last summer and thought she sounded like a great fit for their family. Lamm had only applied to be in the US for the fall, and one semester was all the Paskachs were able to commit to, as well. "Hannah is kind and thoughtful," Julianne said. "Always thinking of others. She bounded into the kitchen to share the details of her day, making any day sound amazing." Lamm's application stated her love of sports, with soccer being at the top of the list. Unfortunately, by the time she arrived it was too late to make the soccer team/ She didn't let that stop her though. "She's super adventurous." Julianne continued. "Who else goes out for cross country and basketball for the first time ever?" By October, Lamm was enjoying her experience so much that she knew she didn't want to go back to Germany after just one semester. The only way for her to stay was to find a new family to finish out the year. That's when Jason and Rochelle Grover decided their family could be her next hosts. "Although it was unexpected, and initially the idea created some apprehension, our experience with Hannah has been tremendously joyful and exciting, " Rochelle said. Lamm felt apprehensive during the transition from one home to another also. "I was very nervious, and I wondered if everything would go well and if we would get along well, "she said. "But I should not have worried. THey welcomed me into their home and soon treated me like their own child or real sibling." "Hannah is a very aware person and worked hard to understand how she fit in," Rochelle went on to say,"She was always looking out for how she could contribute to our family." During the spring semester, Lamm continued to try new things by going out for the track team as a runner and a pole vaulter. In addition, she traveled with the Grovers on a family vacation to Utah and Colorado, a trip she will never forget. "I loved getting to know their extended family, and hiking and skiing in the mountains." she remembered. "All the rocks and mountains were very pretty and so impressive." The Paskachs, the Grovers, and Lamm all embraced the chances to learn about each other's cultures through their time together. "She learned of our faith, and shared hers," said Rochelle. "We taught each other our favorite recipes and learned just how good chocolate chip cookies and Nutella are. What makes us most happy is how Hannah accepted, befriended, and loved all of our children and family." Amanda Hauck, community representative for Ayusa, summarized Lamm's exchange experience. "Hannah never stopped trying to better herself, and wanted feedback and help with how to improve and grow." Hauck said. "She always looked for opportunities to reflect on how she could have deeper and more meaninful relationships while she was here. And she always knew how to light up the room with her smile." Susan Farbo, school counselor for Delano High School, offered her own description of Lamm's stay. "The cool thing about Hannah was, she came intimidated, quiet and shy, and left empowered, energized, and connected," Farbo said. Farbo also acknowledged her desire to increase the number of students involved int he exchange program for the upcoming school year to as many as eight. Currently, there are only two foreign students slated to attend DHS in the fall. Ayusa is looking to match all of their 2016-2017 students with host families in Delano and the Twin Cities by July 31.